Enjoy up to 60% off your favourite designer brands! We are glad to inform you that from now on you can enjoy your shopping experience with a 60% discount for your favorite designer brands. Such brands as Molo, Fendi, Kenzo, Stella McCartney Kids, Moschino and many others provide young customers with a great variety of fashionable clothes that will suit absolutely any taste in fashion. The clothes and footwear are available in a variety of colors and color combinations. All pieces are produced from the finest-quality materials and fabrics that will delight you with their softness and delicacy. And from now on all this is available for a highly affordable price! There is also an abundance of lovely and cute accessories for girls and stylish accessories for boys that will make the outfit of your child complete. Once you’ve chosen the right outfit for your kid, you can enjoy choosing the suitable accessories and footwear that are all produced by the leading designer trademarks on the fashion market. 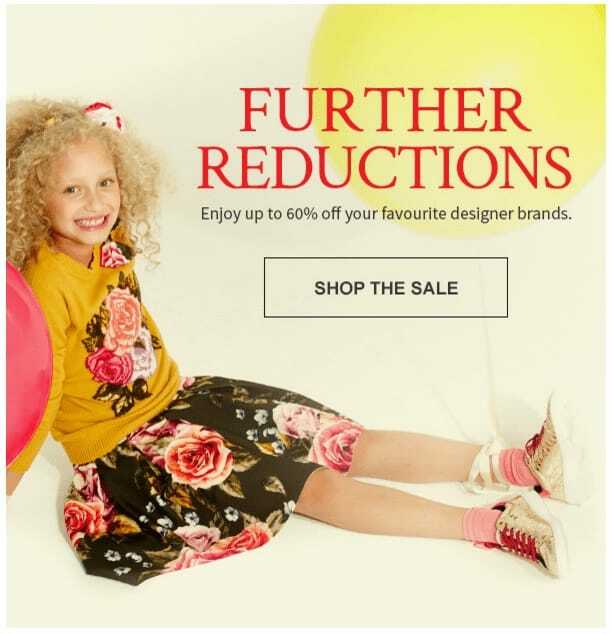 World-class designers continue to cater for the needs of numerous children around the world and now you can buy some of the trendiest and most fashionable items for a reduced price. Check out the collections of boys’ and girls’ wear to find something really adorable and stylish for your little fashionista. We are sure that your child will enjoy wearing trendy clothes as a casual wear or on special occasions. If you are getting ready for some special event, fashionable clothes are a must-have purchase, while matching accessories will make the outfit of your child livelier and more amusing. Don’t hesitate to look through the range of clothes, footwear and accessories provided by the leading designers with love and care for children and childhood! Choose the best-fitting and best-looking clothes for your little kid and he/she will reward you with a happy smile!